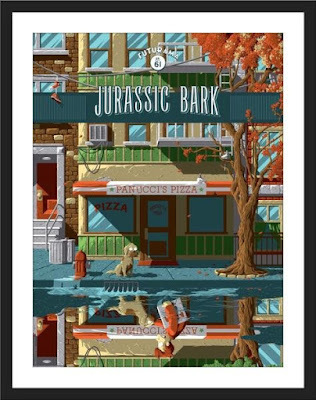 Later today, Bottleneck Gallery, in conjunction with Acme Archives, will be releasing a killer new Futurama screen print by Florey entitled “Jurassic Bark”. Based on the seventh episode of Futurama Season 4, “Jurassic Bark” retells the story of Fry’s beloved dog from the 20th century, Seymour. It’s a heartbreaking episode that you have to watch to truly understand. “Jurassic Bark” by Florey is an 18”x24” hand numbered Futurama screen print. Limited to 250 pieces, this wonderful print goes on sale at 12pm EST today, Tuesday, November 8th, at the Bottleneck Gallery online store for $40.